Domaine des Lilas offers 4 bed and breakfast rooms : two double rooms and two family rooms. The chambres d’hôtes are located on the first and second floor of the house. All rooms are spacious, comfortable and have their own private bathroom. Our bed and breakfast is inspected by Gîtes de France and received 3 “corn ears” (stars). On the ground floor you can use the dining and sitting room with televsion, books and toys for the children. Our bed and breakfast is directly near the river the Couze. In our garden, you can enjoy nature and there are severals seats to relax. For the children there is a playground with zip line. There’s also a above-ground swimming pool to cool down. Our bed and breakfast is also very suitable for a longer stay ! You can relax in our living room : playing a game, watching a movie or read a book. Every morning we serve a delicious breakfast with a variety of bread, croissants, cheese, meat and jam. 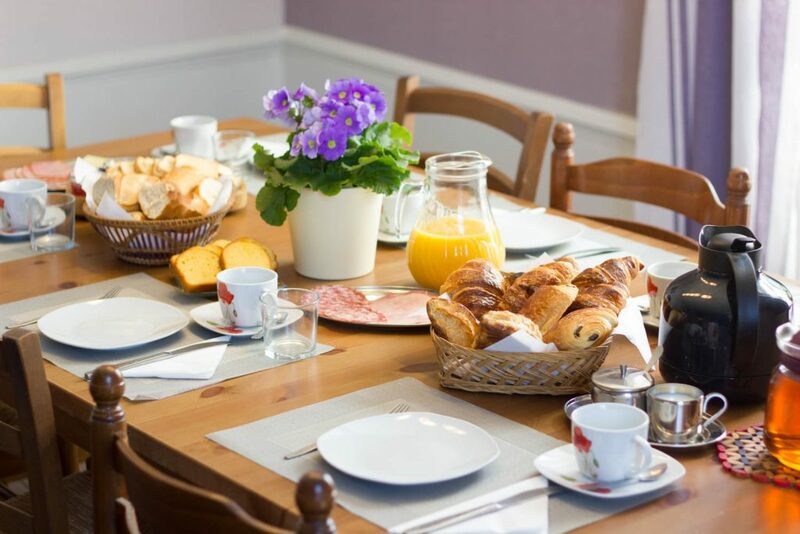 What do we offer you during your stay in our bed and breakfast in the Auvergne ? 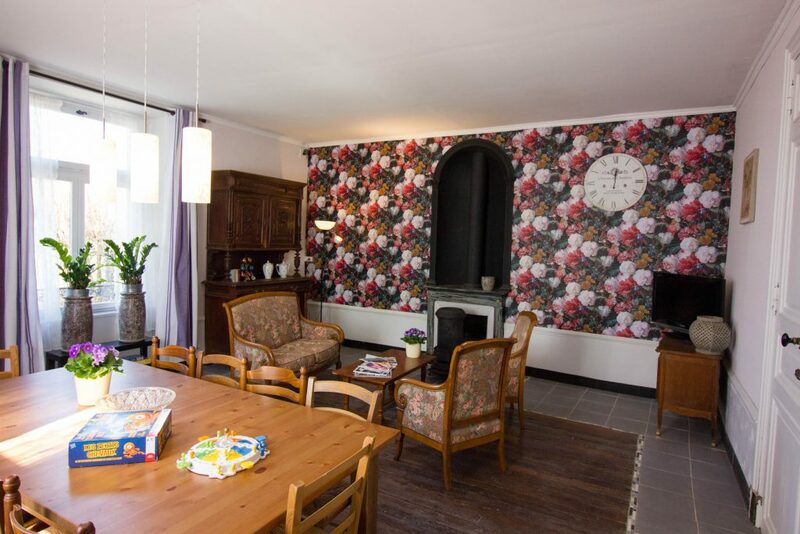 This cosy and comfortable double room of approximately 20m² is located on the second floor. For this rooms there are two options : a double bed of 180 cm or two single bed of 90 cm. There is a snug seating area for relaxing. The bathroom has a walk-in shower, sink and toilet. This room is very bright and has the most beautiful view over the grounds. From 75€ per night and 430€ a week ! This spacious doubleroom of 28m² is located on the first floor. The room is very suitable for a long stay. There is a large double bed and a seating area. The double doors, the high closets and the beautiful fireplace makes this room special. From this room you have a view on our beautifull courtyard. The bathroom has a walk-in shower, sink and toilet. From 85€ per night and 490€ a week! Our spacious family suite of 43 m² offers space for 4 people. The family room is on the first floor. In the large room you will find a sitting area and a double bed. Two more beds can be found in the second bedroom. The spacious bathroom has a walk-in shower, sink and toilet. From your family room you have a beautiful view of the grounds and the Lembronnais. The room is comfortable, modern but all authentic elements are preserved like the fireplace, the double doors and the beautiful ceiling. From 129 € per night and 750 € a week! Our second spacious family suite of 45 m2 also offers space for 4 people. The family room is on the first floor. A lovely sitting area for relaxing, a work desk and a large double bed can be found in the spacious room. In the second, lockable bedroom you will find 2 single beds. From your family room you have a view over our garden. The room is comfortable, modern but all the authentic elements have been preserved, such as the marble fireplace, the imposing closets and the round windows.